U.S. Bellows, Inc., the expansion joint division of Piping Technology & Products, Inc., specially designed and fabricated a 54″ diameter tied, universal expansion joint for NASA Space Center. 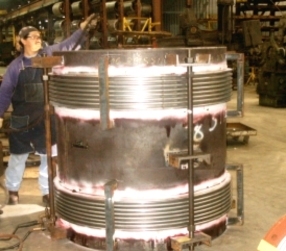 The expansion joints were designed at full vacuum and 450° F and constructed with 304 SS bellows, liner and A516 Gr. 70 spool, weld ends and carbon steel tie rods. The bellows’ attachment welds were 100% dye-penetrant tested.